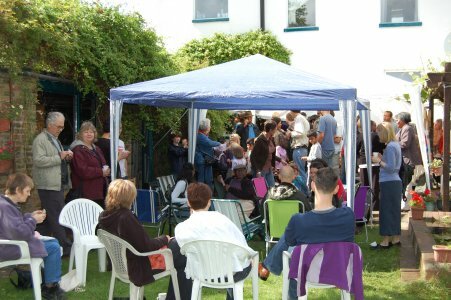 Gazebos saved the day on Sunday 1st July when we held our annual Garden Party at the home of Gerard and Naima Omasta-Milsom.The gazebos were put up in the garden to shelter from the rainstorms! Delicious international food from Morocco, South Africa, Asia and the Caribbean etc was enjoyed. WFTISA Chair Mmapula Tladi-Small gave a speech outlining the work the Thuso charity does. Thuso provides daily meals for 250 orphaned South African schoolchildren and also food packs for weekends and holidays. We will be able to expand the feeding programme to another 250 children in 2008 thanks to over £1000 raised at the party. After hearing Mmapula’s speech new sponsors came forward to support a student by each paying £30 per year to cover school fees and books. Thuso welcomes new members and supporters – please click here.